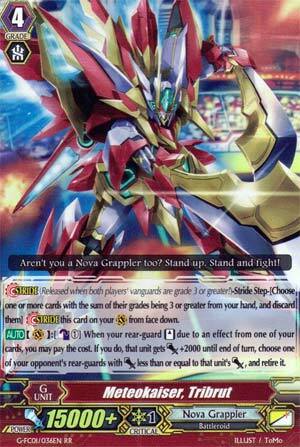 Stride (Released when both players' vanguards are grade 3 or greater! )-Stride Step-[Choose one or more cards with the sum of their grades being 3 or greater from your hand, and discard them] Stride this card on your (VC) from face down. [AUTO](VC):[Counter Blast (1)] When your rear-guard [Stand] due to an effect from one of your cards, you may pay the cost. If you do, that unit gets [Power]+2000 until end of turn, choose one of your opponent's rear-guards with [Power] less than or equal to that unit's [Power], and retire it. Ooh, this one's actually pretty neat. Meteokaiser Tribrut to me sort of fixes the redundancy of Vic-Ten when everything else is standing up already. Every time a unit stands during your Battle Phase, that unit gains 2k until end of turn, then you CB1 to retire a unit the opponent has whose power is equal or lower than the power of the stood unit. Keep in mind anything that stands then gains power like Cool Hank and Viktor means that almost anything you desire will suddenly die. Yes, it's a bit heavy on CB (4 to stand 2 and pop 2 potentially, assuming a good-case scenario) but it's fair enough when a physical +2 and a soft +2 is the outcome. If you're not comfortable with this, Clay-Doll Mechanic exists, right,as does Lady Cyclone? It's not something to SPAM unless your deck's good at unflipping but it helps to avoid redundant scenarios. What I like most about it however is the extra 2k it provides a stood unit. Suddenly chaining Hank or Viktor to a Sazanda shoots its power up from 9k to suddenly 21k, the sweet spot to force 5k more guard out of an 11k Vanguard than usual. That's pretty cool, and even a normal 9k can suddenly hit the 16k threshold to knock out a bit more. I like this a lot. It needs a deck dedicated to the idea of re-standing RGs, so Blaus are pretty much out, for example but it's a pretty hot G-Unit all around. Finally! Something that's not boring! So, this one, when one of your rear guards stands by the effect of one of your cards, you can CB1, give it +2000 power and then retire one of your opponent's rear guards that are weaker than it. That's... Pretty good, especially since it isn't once a turn. Hooray, Cool Hank is better than ever! The ONLY downside to this card that I can see is that I don't think it works off of Stand Triggers, though I could be wrong. Sometimes it's not always clear to me.